Always ask someone to measure you, never be temtped to measure yourself. Our website will ask for your measurements in inches only, so please bare this in mind. Stand relaxed (do not breath in!) with your feet together and look straight ahead at all times. Ensure the tape measure is level all the way around, it shouldn't be sloping or slanting. 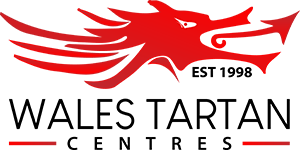 If you need our assistance, please call +44 (0)1792 474685 or drop us an e-mail (sales@welsh-tartan.com). Measure around your neck with one finger inside the tape for comfort. The tape measure should include the shoulder blades. Measure from the crown to cuff (where the sleeve meets the shoulder to the bottom of the cuff). If you don't have a jacket to measure, measure from the top of your shoulder down to 1/2 inch past the wrist bone. The Kilt waist is much higher than a trouser waist. This should be a snug measurement at the widest point of tummy, at navel height. Please note - This measurement only applies to our "Tartan Trews", NOT our "Golf Trousers" as these are not high waisted (see Trouser Waist below). Measure around your waist at navel height. Take the measurement firmly, so the trews may sit comfortably without falling down. Measure the widest point of the tummy. Add 1 inch for movement (or take a loose measurement). PLEASE NOTE, THIS IS NOT YOUR WAIST SIZE. Remove any items from your pockets. Measure around the widest point of the seat / hips. As illustrated above, this is normally around the buttocks. Put three fingers inside the tape to allow room for comfortable movement. This measurement is best taken whilst kneeling down with the body upright and back straight. Measure from the Kilt waist (as above) to the floor and take off 1/2 inch. Please take this measurement wearing formal trousers if possible, up on the waist (not on the hips). Jeans are acceptable, but must be worn on the waist, but once again, not down low on the hips. Please note - This measurement only applies to our "Tartan Trews" and "Golf Trousers". Measure from the same height you measured your waist at, down the OUTSIDE of the leg to the floor. Please note - This measurement only applies to our "Golf Trousers", NOT our "Tartan Trews" as these are high waisted (see Trews Waist above). Physically measure your waist size, do not rely on casual wear such as jeans or shorts. 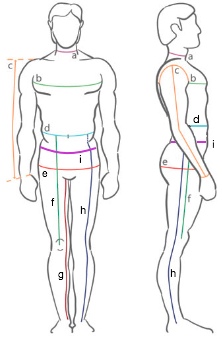 Formal trousers are worn higher than casual wear (up on the waist) so please measure just above your hip bones. Stand relaxed with your feet together and look straight ahead at all times. Ensure the tape measue is level all the way around, it shouldn't be sloping or slanting. This should be a somewhat loose measurement for comfort, but not too slack. Relax your arms down to the side before recording the final measurement. Relax your arms down to the side. Measure from crown, where sleeve joins the shoulder, to cuff (full length). It's personal choice how long you would like your sleeve length, so please select the desired length when ordering. Please do not go by garments you have at home. This measurement should be taken at the slimmest point of your waistline. Measure firmly, but not too tight. Measure the widest point of your hips. Add 0.5 - 1 inch for comfortable movement. This should be at least a few inches bigger than your waist size. Take this measurement down the side of your leg. 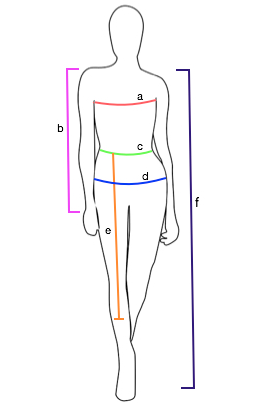 Measure from c) Waist to your desired length. Longest length available is 27" (or 19.5" for mini skirts). Measure back length from nape of neck (top of spine) to floor. Remove at least 1 inch for full length.